You may be accustomed to using RSS feeds, Twitter, Google Alerts and other tools for newsgathering. Here are four reporting techniques you may not have thought of. Homicide Watch aims to track and report on every homicide in Washington DC. This example is from two years ago but it neatly illustrates the potential of reporting from analytics. Laura Amico, who launched the site, picked up a report from the police log that there had been a suspected murder. 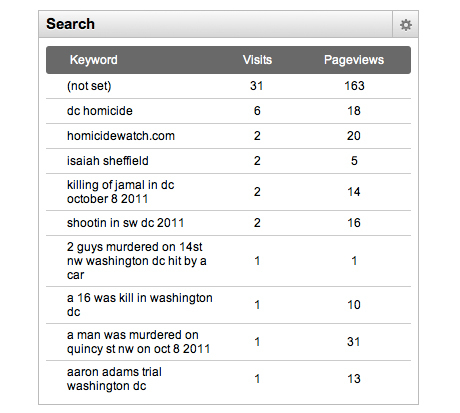 By looking at Google Analytics and what keywords people were using to search Homicide Watch, she found clues within three of the searches, which she blogged about at the time. The other searches featured were irrelevant to this case. When we spoke to Amico last year, she told Journalism.co.uk how analytics became part of the reporting armoury at Homicide Watch. "If I see a search for John Smith, I might search Facebook for 'RIP Johnny', or 'Johnny killed'," she explained. 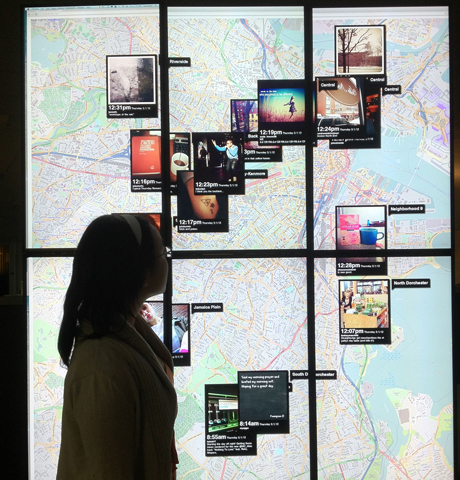 The Boston Globe has a wall, known as Snap, that displays geolocated Instagram pictures. In the days following Hurricane Sandy last year, when the schools, colleges and workplaces were closed, Chris Marstall, creative technologist at the Boston Globe, noticed something interesting. He realised that a lot of photos of bottles of alcohol were being shared. The conclusion was that people were using the day off work for some daytime drinking. When considering the light-hearted nature of the 'lost Monday' story, it is important to keep in mind that Boston is four hours' drive from New York City, which took the impact of Sandy. Soon after Sandy, Marstall told Journalism.co.uk about what they had learned from using Instagram for newsgathering. "It's really been an interesting glimpse, kind of virtual drone journalism, to be able to look into people's houses, into people's lives." Tip: You could use IFTTT (If This Then That), a free tool which allows you to connect accounts and platforms, to monitor Instagram. For example, you can create a recipe in IFTTT and connect Instagram to a Google Spreadsheet. It will then save the details of every picture with a particular keyword or hashtag to a new line in the spreadsheet. You could even set up alerts so you receive an email when a new picture is added (by going to tools / notification rules in the spreadsheet). 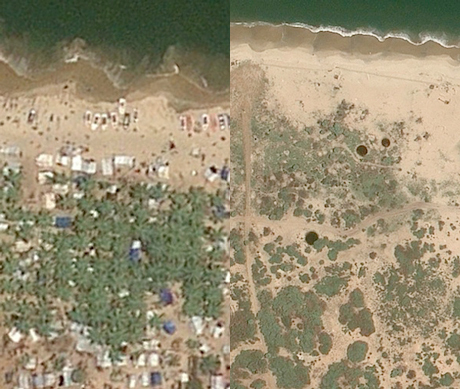 There is a timeline function in Google Earth which allows you to see satellite pictures of an area over time. This was used by Groundviews, a Sri Lankan news site, to show the devastation that occurred towards the end of the civil war. In the first picture you see the presence of camps, of people, in the second there is an absence of life. Sanjana Hattotuwa, founding editor of Groundviews, spoke to Journalism.co.uk about what the images show. "It is impossible to ascertain who shot what and when, but it is very clear from the imagery that it's a scorched earth policy, you can see pock marks all over the place." 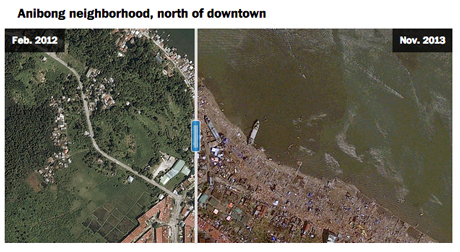 Here is a more recent example, this one from the Washington Post, which used Google Earth imagery to tell the story of the devastation following Typhoon Haiyan which hit the Philippines this month. Tip: You will first need to download Google Earth. You can then use the historical imagery tool to go back in time. For example, we tested it out looking at Canary Wharf and images are available as far back as 1945. The Los Angeles Times has robots to gather and write news. One of the journalists, Ken Schwencke, has written an algorithm which takes a feed from the US Geological Survey site. When an earthquake above a certain level on the Richter scale strikes, the algorithm will auto-write and publish a story. 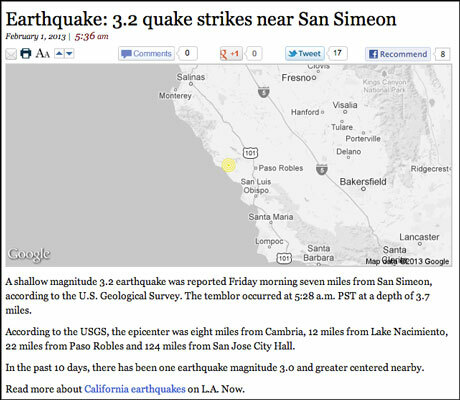 For example, the headline in the story above is generated, with the computer writing: 'Earthquake: 3.2 quake strikes near San Simeon'. The robot reporter is writing the story a journalist would otherwise have put together, no doubt copying and pasting from the geological report. Here is another example from the LA Times, and how homicides are reported. The Los Angeles County coroner's office releases a list of deaths it determines to be homicides. The robot takes that information and writes the headline and first paragraph, with a reporter then expanding the story. The paragraph surrounded by a red box is the robot's, the rest is down to the reporter. Ben Welsh, a database producer at the Los Angeles Times, told Journalism.co.uk: "Algorithms can help you find and report the news. You can write code that will ask and answer the common questions that a reporter would ask when looking at that same dataset." Tip: If you are a reporter in an area affected by earthquakes, you can set up an IFTTT alert so that you receive an email or a text message when one strikes. You could also set up an alert every time a police report is posted on a website. For example, this IFTTT recipe connects RSS and Google Drive. Every time an appeal is posted on the Met Police website, a line will be added to a spreadsheet. You could also set up an email alert. These four examples were flagged up in a presentation Journalism.co.uk gave to journalists at Swedish Public Radio. A video of the hour-long presentation, which is headlined 'around the world in online innovation' is at this link. Examples of innovative uses of sharable video, also flagged up in the talk, are highlighted in this post.